ABILENE, Texas–(BUSINESS WIRE)–New Horizons was joined in Abilene by local dignitaries, including Mayor Archibald and State Representative Susan King, other elected officials and business leaders in breaking ground on the first phase of New Horizons Community Center of Care: Audrey Grace House, which will provide residential and other services for at-risk children and youth. 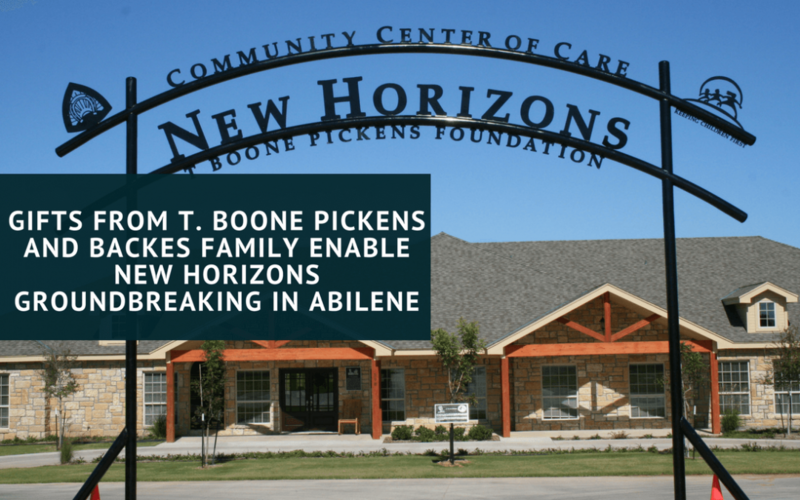 Groundbreaking for the new facility was made possible by a gift from Dallas oilman and philanthropist, T. Boone Pickens, who has donated $750,000 to New Horizons to help construct the much-needed residential center in Abilene, Texas. New Horizons Community Center of Care will be located at Business I20 and Medical Drive, approximately 1 mile east of downtown Abilene. Its first phase will be named the Audrey Grace House in memory of a child lost by Mr. and Mrs. Leon Backes of Dallas. The Backes were the first major contributors to the Abilene project through their fundraisers in the horse community. With help from Allen and Chris Leese, who own www.pleasurehorse.com, the Backes helped organize silent auctions benefiting New Horizons during the last five years. On the Web site, quarter horses and horse-related items including training sessions, saddles, stud fees, and more, have been auctioned raising approximately $200,000 which the Backes have matched with personal gifts. Mr. Backes company, Provident Realty Advisors of Dallas, has also supported New Horizons with sponsorships and fundraisers since 2002. Audrey Grace House will help New Horizons serve more than 1,000 children and families each year in Abilene, Central and other West Texas communities through a continuum of care. New Horizons is licensed by the Texas Department of Family and Protective Services and is a member of the Texas Alliance for Child and Family Services.